The first case was violence and intimidation against journalists in Papua and West Papua wanting to cover the trial of Forkorus Yaboisembut and his colleagues at the district court in Jayapura on 8 February when they were physically intimidated, pulled and pushed as they were entering the courtroom. Those responsible were members of the police force in Jayapura. The victims were: Katerina Litha of Radio KBR 68 H Jakarta. Robert Vanwi of Suara Pemnaharuan, Jakarta, Josrul Sattuan of TV One, Irfan of Bintang Papua, and Cunding Levi of Tempo. 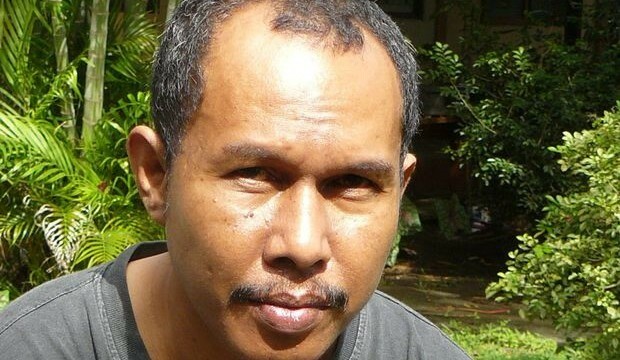 The second case was against Radang Sorong, a journalist with Cahaja Papua and Paskalis of Media Papua, from February until May in West Papua by the police chief of Manokwari, who were preventing journalists from reporting expressions of support for dialogue and a referendum in Papua. Three local journalists said that they had been under pressure while writing critical reports about political matters, law and human rights violations and political prisoners. One of the journalists from Manokwari was instructed to restrict his reporting about political, legal matters and human rights violations. The third case was in Abepura on 20 March when Josrul from TV One, Marcel from Media Indonesia, Irfan from Bintang Papua and Andi Irfan of Radio KBR 68 H Jakarta were attacked by members of KNPB, the National Committee of West Papua who were involved in an action outside the Post Office in Abepura. On a separate occasion, outside Polimak, Jayapura, Timbar Gultom of Papua Pos was ordered to identify himself. When he replied that he was from Papua Pos, the people did not believe him and started chasing him. He was able to hide in a house nearby. The fifth case was when three journalists in the district of Jayapura, Yance of Radio Kenambai Ombar, Putu of KBR 68 H Jakarta and Suparti of Cenderawasih Pos were verbally intimidated and chased by some members of the KNPB.on 20 March. The sixth case was when a journalist from TV One, Josrul Sattuan was beaten by an unidentified person when he was trying to report on the situation in Jayapura following a series of violent incidents and shooting incidents that occurred in various in places in Jayapura. The physical attack occurred at Abepura Circle on Thursday evening on 7th June. The seventh case was when a journalist from Metro TV, Abdul Muin who was in Manokwari was attacked by someone from the Fishing Service in who intimidated him with an air gun.The victim told JUBI that the incident started when a member of the Fishing Service sent him a brief message on 8th June asking him and other journalists to cover an incident of bombing a hoard of fish by a group of people who were being held in the Manokwari Prison. The eighth case occurred in Timika on 20 September.The victim was Mohammad Yamin, a contributor to RCTI, Simson Sambuari of Metro TV, Husyen Opa of Salam Papua and the photographer for Antara News Agency, and David Lalang of Salam Papua.They were prevented from recording some events in the Pamako Harbour. The ninth case involved Oktavianus Pogau of suarapua.com and stringer for Jakarta Globe. This occurred in Manokwari on 22 October. Okto were beaten up by several members of the police force, some in uniforms and others not wearing their uniforms, who were battling with members of the KNPB in Manokwari. The victims was thought to be part of a crowd of people involved in a demonstration, even though they had clearly identified themselves. The tenth case was when Sayied Syech Boften of Papua Barat Pos was attacked on 1 November by a person who identified himself as a member of the local legislative assembly, Hendrik G. Wairara. The victim was threatened and intimidated among others things by phone. The victim was warned to stop reporting about corruption in a project involving the extension of the electrification system and the maintenance of BBM machinery in Raja Ampat District. On the same day, the assistant of the chairman of the the local DPRD flew into a rage while he was at the editorial office of Papua Barat Pos. The eleventh case occurred on 8 November when Esau Miram of Cenderawasih Pos was intimidated as he was reporting on a gathering at the office of the Commander of the XVII Nilitary Command and all the heads of departments in Papua.They were accused of being terrorists even though Esau had shown his identity card as a journalist. The twelfth case occurred on 1 December when Benny Mawel of JUBI was interrogated by members of the police force near Abepura Circle for reporting about a large crowd of people who were carrying banners while marching from Abepura to Waena. Benny showed his journalist identity card, but a group of around ten people accused him of not being a journalist. As he was travelling on his motorbike towards a repair centre, he was followed by some people there who starting asking whether he knew where Benny was. Victor Mambor added the following: AJI reported two cases, the shooting of a Twin Otter plane belonging to Trigana Air by an unidantified person in Mulia Airfield, Puncak Jaya on 8th April which killed Leiron Kogoya who was first said to be a journalist of Papua Pos, Nabire and then the arrest and deportation of a Czech man, Petra Zamencnik who identified himself as a journalist with finecentrum.com. On 9 February, there was inconsistently about the status of the victim, whether he was a journalist or not, or whether he was involved in journalistic activities. Suroso also confirmed that when the identity of Leiron was checked, it turns out that he was not at the time engaged in journalistic activities.but had gone to Mulia for personal reasons. 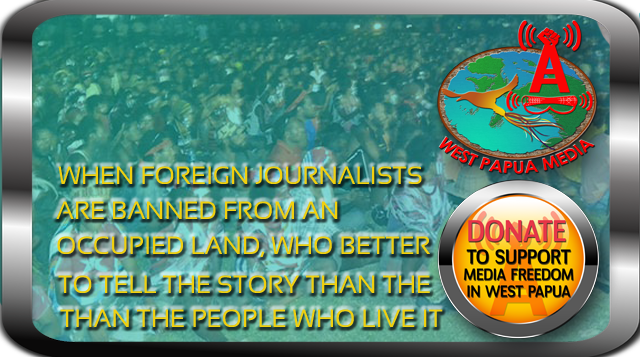 Leiron had not registered himself as a journalist of Papua Pos Nabire. As regards Petr Zamencnik. he was unable to prove that he was a journalist. 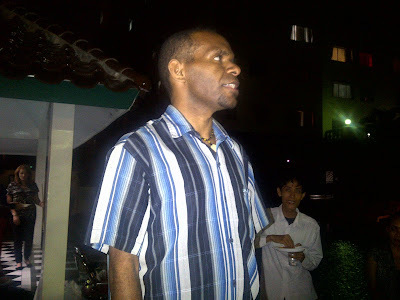 AJI Jayapura sought confirmation with finecentrum.com about his status and he was described as being the editor for financial affairs in the Czech Republic. Jakarta (23 October 2012):- Police today attacked a journalist covering a rally organised by the West Papua National Committee (KNPB) in Manokwari in West Papua. Oktovianus Pogau, a reporter with Suara Papua and a contributor to the Yayasan Pantau, was beaten by five policemen while trying to take pictures of police use of excessive violence against the KNPB demonstrators in front of the State University of Papua, Manokwari. Pogau had displayed his press card, but some police did not stop the beating. He sustained injuries to his face. 4. Arrest and prosecute the perpetrators of violence.